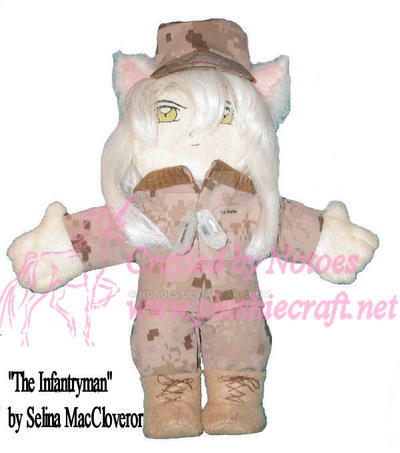 This was a commissioned as a gift for Selina MacCloveror of her fanfic "The Infantryman" . This specific design is not available for commission. 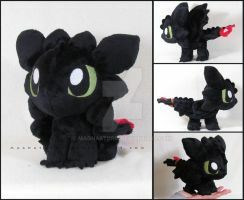 Plushie commission information is on my journal here, my website Plushiecraft, or email me at plushiecraft@gmail.com. 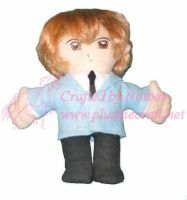 Everytime I see your plushies, they are getting better and better. Nicely done!! Thank you! That one was a real labor of love, I had been wanting to do a military one and I was really happy with the material I found for it. One of my uncles and one of my brothers were Marines while another brother, nephew, two sisters-in-laws and another uncle were Army. I think another uncle was Navy too so military is very dear in my family. So I'm really glad I was able to make that one so well. Thank you, again, for doing such a fantastic job on him. She adores him, and he makes me smile just looking at him. Fantastic work and that's why I keep coming back!